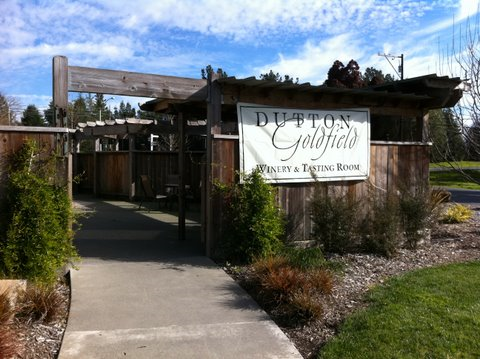 Dutton Goldfield Winery's patio sadly lacks the beautiful views that most of Sonoma County's wineries offer. 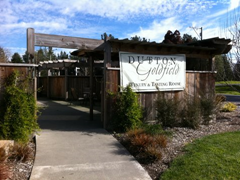 Dutton Goldfield Winery has a new tasting room on Gravenstein Highway North in Sebastopol. They used to participate in the Visa Signature program, but sadly have stopped. They now charge a $10 tasting fee for 4 wines, which is rather steep for Sonoma County. The fee is refunded with purchase, and tasting is also free for wine club members or if you bring in a cork from one of their wines. 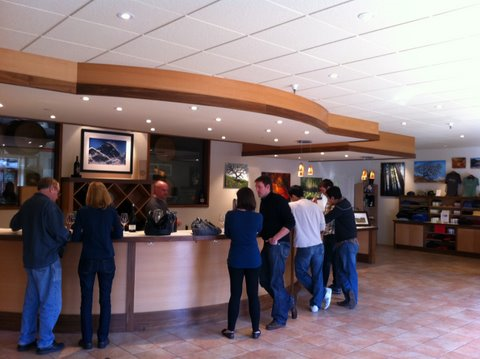 The tasting room doesn’t offer the picturesque setting of most of Sonoma County’s wineries. You won’t find any sweeping vistas out over the vineyards or views of mountains. They do, however, have a lovely outdoor patio with seating. 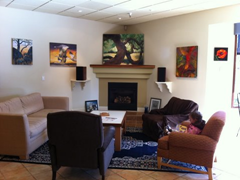 Inside, comfy armchairs face a large fireplace, perfect for relaxing on a rainy winter day. 2008 Dutton Ranch Chardonnay – This Russian River Valley wine had a lovely bright citrus with a lush buttery finish. We enjoyed it, but didn’t find it worth the $35 they charge. 2008 Freestone Hill Vineyard Pinot Noir – This Russian River Valley Pinot has strong black cherry, finishing with a very mild spiciness. We enjoyed it, but found it far over-priced at $58. At Dutton Goldfield Winery tasting room, the cozy seating in front of their large fireplace would be perfect for relaxing on a rainy winter day. 2008 Devil’s Gulch Vineyard Pinot Noir – This wine is made from grapes grown almost at the tip of Tamales Bay, in Marin County. We love fruity wines, so with plenty of cherry, blackberry and a bight acidity we enjoyed this Pinot, but again thought $58 was just asking too much. 2008 Cherry Ridge Vineyard Syrah,$35 – This Russian River Valley wine had too much pepper for our taste. Of course, this is why we are generally not Syrah fans. Overall, while we felt Dutton Goldfield had good quality wines, there are so many fabulous wineries in Sonoma County set in such gorgeous surrounding that we’d pass on this one unless you happen to be driving by (as we were).